Click Here to get a content consultation from Sarah. You already know the threat of getting left behind in terms of creating content at scale for your real estate business. The health and future of your entire business depend on your ability to be creating massive amounts of content and marketing that content on a daily basis! If you are like most real estate agents, that reality is nauseating and horrifying. Some agents simply learn that reality and bury their heads in the sand fingers crossed that it isn't true. How are you supposed to run your real estate business, research, create and market custom content, and also live your life? By hiring a real estate content writer, of course! 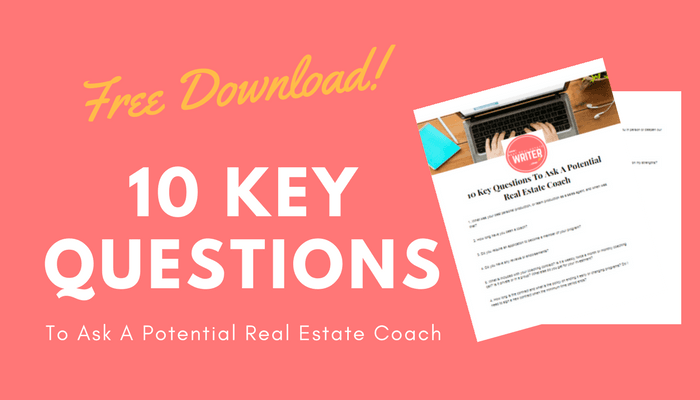 The beauty of hiring a real estate content writer is not just that you will be able to keep up, but you may even be able to get ahead. The true rock stars of copy writing will not only be able to write blog articles for you, they will be able to dramatically improve your search engine optimization (SEO), they will position you as an expert in your area, and they will be able to attract your ideal customers to you. From time and energy saved to clients and cash gained, investing in a real estate content writer is a no-brainer. There are actually quite a few options out there in terms of places to scoop up content writers. Some are okay, some are abysmal, and others are earth-shatteringly amazing. The odds of hiring a real estate content writer that truly gets you, your business, and can reliably produce high-quality content at scale is like finding a needle in a haystack. Not so much because they don’t exist (although they are a bit rare right now), but it is because you are probably clueless like most people about what to look for in a real estate content writer. Let’s fix that problem shall we? Here is your insider’s guide to hiring a powerhouse real estate content writer so you can destroy the competition and rise to the top of your market. One of the most commonly overlooked qualities in a phenomenal real estate writer is their experience in real estate. Honestly, the number of real estate agents and team that I come across that hire a content writer that doesn’t understand the first thing about real estate is astounding to me. This is especially shocking to me when they are paying their writers an hourly rate because they are paying the writer to study and learn about the industry, rather than do their job, which is to create convincing copy. One of the biggest benefits of hiring a real estate content writer to position you as a local expert is to save you time and energy. Do not undo that progress by hiring a writer that doesn’t have a strong comprehension of these topics because you will end up becoming a teacher, and an editor which will cost you the time you were looking to save in the first place. Search engine optimization, also known as SEO, is one of the main reasons you need to hire a real estate content writer in order to be able to compete online. In a nutshell, SEO is a collection of constantly evolving criteria and algorithms used by major search engines like Google to sort through all of the content on the internet and produce results for you every time you run a search. The list of ways to rank at the top of Google goes on for miles and changes at a rate of 1.5 times per day on average (overwhelming I know) but the one thing that never changes is Google’s demand for high-quantity, and more importantly, high-quality content. Therefore, it is pretty obvious that you are going to need to hire a real estate content writer that can deploy SEO tactics into their writing so that you can attract your ideal clients to your website organically through Google. Keywords are the actual search terms that you type into Google to find something. The most effective keywords are those that have a high number of monthly searches but very low competition because it will be easy to rank for them and get found. Let’s say that you want to get found for the keyword “Rhinebeck, NY luxury real estate agent”. For you to show up at the top of this search, your website will need to have loads of high-quality content featuring that keyword at a rate of .5-1.5% against the total number of words on the page. Any more, or any less, and Google will begin to punish you by pushing you further down in the search results. Headers, often referred to as H-1, H-2, and H-3 tags for short in the tech and copywriting world, are also an important element of web and blog SEO. Your headers play an important role with your keywords and improve your reader retention rate because they make your content more scannable. Meta titles and tags are also associated with getting ranked for your desired keywords. Each of these meta elements is used to describe the content on your page to Google more explicitly so that it can define what it is scanning. For example, if you are trying to rank for “Rhinebeck, NY luxury real estate agent” you would post images of yourself with Meta titles that use that keyword. When you hire your real estate content writer, you need to make sure that you are hiring someone with a clear understanding of content strategy and has the ability to develop one that will make sense for the results you are planning to achieve. When you are investing your money into developing your content you need to make sure that you are hiring a writer that is skilled in writing content that not just appeals to your target audience, but also sells to them in a ninja-like fashion using techniques like Neuro-linguistic programming. They need to be able to take dry topics like real estate title and turn them into interesting and entertaining copy that helps people connect with you and drives sales. Beware of the content writer that is happy to aimlessly produce content for you at random without a clear focus and set of goals in place. These writers do not actually care about you, your success, or the returns you are getting on your investment. All those writers care about is getting paid and that is not the type of real estate content writer you want to invest you time in. Depending on what your priorities are, your real estate content writer should also be able to develop a strategy for you that is reflective of those priorities. 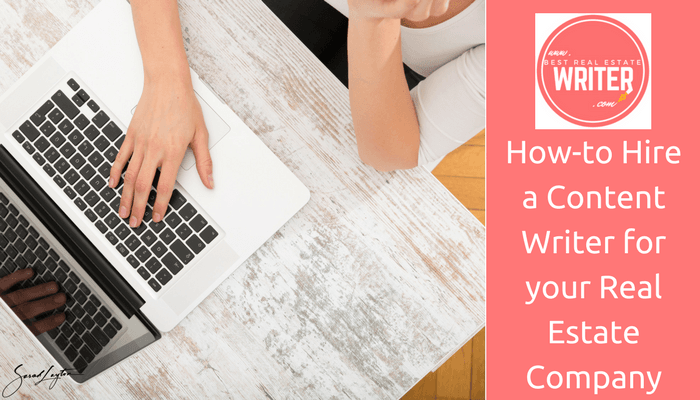 When you are searching for a real estate content writer to help you save time, build trust in your real estate brand, and attract your ideal customers, you need to remember that you get what you pay for. You should go into the hiring process with the intention to find a writer you can have a long-term relationship with because the longer you work with your real estate writer, the more they will get to know you and the less direction and editing they will need. The longer your writer is with you, the more loyalty they will feel to you as well, and the more committed they will be to your success. There are content writers out there that will work for rock-bottom prices, but again the quality of the content and the service you receive will be rock-bottom. I am always worried that you will get burned by one of the many international scammers out there that will market themselves to you as the perfect copywriter, only charging pennies, that will take your money and run or even steal your identity. If you want a long-term real estate content writer that will save you thousands of hours of work, has proven results, and is guaranteed to deliver you a powerful content strategy, then I would love to hear from you. My clients tell me that I have a knack for translating complex real estate concepts in a way that not only attracts their ideal clients, but builds relationships that get them hired. Find out how I can help you attract your ideal real estate clients!